Scania and the transport industry are part of the climate change problem but also part of the solution. “We therefore aim to drive the shift towards sustainable transport,” said Scania’s President and CEO Henrik Henriksson when speaking at the International Energy Agency’s Global Conference on Energy Efficiency. At the conference in Paris, ministers and high-level government officials, business leaders, financial institutions and civil society from more than 40 countries gathered to discuss how to enhance energy efficiency. 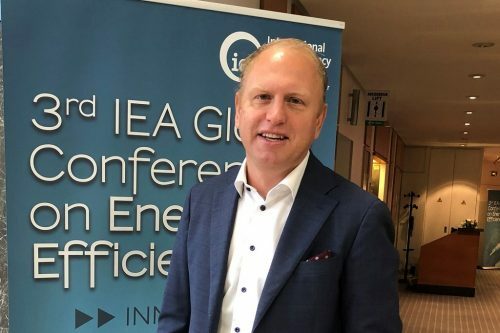 Henrik was invited as one of four business leaders to give their perspectives on the importance of energy efficiency for their organisations. He recounted that the transport sector’s challenge is to decouple growth in demand from growth in carbon emissions. Citing the conclusions of the Scania Pathways study, he noted that decarbonisation can be achieved with a resultant lower cost to society. It will require rapid electrification in combination with strong deployment of sustainable biofuels. Henrik particularly highlighted the advantages of producing fuels, such as biogas, from sludge and organic waste. Building electric roads can also effectively contribute to reducing carbon emission, especially considering the fact that 80% of European goods transports are concentrated to a mere 5% of the road infrastructure. Regardless, determined action must be taken here and now, he asserted. We cannot wait for the perfect future solution when faced with the immediate challenge of climate change. The climate challenge will additionally require overall efficiency improvements of vehicles and logistics. The Pathways study assumes that one-quarter of the obtained carbon emission reduction will emanate from efficiency enhancements. The Scania Transport Laboratory, which operates some of the company’s internal transports, has, in practice, shown that halving carbon emissions per tonne-kilometre can be realised. But to reach further requires greater commitment from transport buyers, Henrik stated. Transport buyers must demand efficiency improvements when purchasing logistics services. In fact, trucks in Europe are only loaded to 60% on average. “Better logistics planning facilitated by connected vehicles can contribute to more efficient transport, he explained. “Transport efficiency can also be improved by permitting longer and heavier vehicle combinations, such as those now in operation in Finland and Sweden.